Is Buying Organic THAT Important? No herbicides, pesticides, or fungicides. The U.S. Environmental Protection Agency (EPA) is in charge of ensuring the safety of these chemicals. A few hangups here are that sometimes chemicals aren't known to be carcinogenic until years later (remember DDT?) and that the EPA is basing safety recommendations on the assumption that someone will only ingest small quantities of them in the residue left on the produce. While that little bit of residue might not be very harmful in itself, the cumulative effect of ingesting (and using) a lot of products with small amounts of toxins over a lifetime may create serious health concerns. No genetically modified organisms (GMOs). Over the course of history, man has crossbred plants to produce hardier crops. In the past couple decades, man has gone even farther than that by manipulating DNA to produce organisms that couldn't be found in nature. A big example of this is "Roundup Ready" seed by Monsanto, which produces crops that have Roundup inside them. What could a traditional farmer crossbreed to create a plant like this naturally? Nothing - it can only be produced in a lab. Experiments have also been done to change plant and animal DNA to bring out more of an intrinsic trait or borrow traits from another species. Quality soil. Most people just think of dirt when they hear the word soil, but in reality soil is an ecosystem. Plants need to pull nutrients from the soil in order to grow, and those nutrients will run dry if they're not replenished. While conventional farmers usually use synthetic fertilizers for this purpose, organic farmers rely on traditional methods that focus on keeping soil microbiomes happy, like crop rotation and using compost (decomposed plant matter that's naturally rich in nutrients). So...what's all that mean? Organic farming equals no imbalances in the environment due to synthetic fertilizers or chemical killers - at the Standard Process farm tour we took a few weeks ago our guide said that some of their neighbors sprayed pesticides, herbicides, and fungicides on their crops every three days! - and no potential long-term threats to the environment because of genetic engineering either. 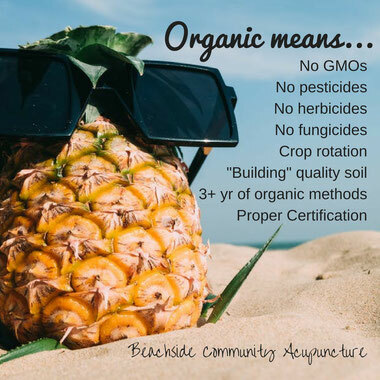 Organic gets back to the basics: Keep soil thriving for healthy, nutrient-rich plants now and for future generations and farm as naturally as possible. Outside of being environmentally conscious, you'll also save yourself from a lot of health "maybes" by eating organic foods. For all we know eating genetically modified foods that are sprayed with chemicals won't have a huge impact on someone's health over a lifetime, but with the rise of serious, chronic diseases since the industrialization of the food industry the past few decades, we always tell our patients to do everything in their power to decrease the toxic load on their bodies just in case. The Traditional Chinese Medicine that we practice is all about getting the body aligned with nature, and eating naturally grown foods is one of the best ways to do that. That being said, organic certification takes money and effort, and some small farmers just don't have the resources for it. Buying local is always best - produce that's shipped across the country will have to be picked before it's fully ripe, regardless of whether it's organic or not - so talk to your local farmers. If your favorite blueberry stand is using seeds passed through generations and growing plants in the exact way that their family has been growing them for centuries, they're probably farming organically without the official label. 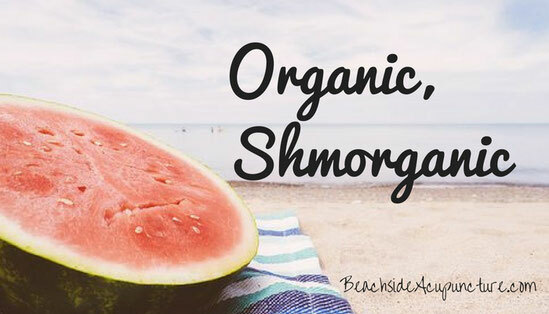 We hope this cleared up some of the confusion surrounding the organic label - the answer to this blog's title is YES - but we encourage you to do your own research on this hot topic too. Click through the links we used in the paragraphs above if you haven't already, and check out additional resources below. (We especially love The Unhealthy Truth by Robyn O'Brien, whom the New York Times called "food's Erin Brockovich".) When you decide where you stand on the issue, stick to it! Organic farming isn't easy and organic foods are going to be more expensive because of that. Make a grocery shopping budget and plan meals in advance so you won't feel overwhelmed financially. Companies have noticed the popularity of organic foods and are producing more organic options; you can make a difference simply by voting with your dollar! The Unhealthy Truth by Robyn O'Brien **read for her entire works cited!